Abu Dhabi, UAE - 4 November 2018: Emirates Steel, the only integrated steel plant in the UAE, has signed a four-year (2018-2021), high value contract with Vale, the world’s largest producer of iron ore and iron ore pellets, to supply iron ore pellets for its steel production in Abu Dhabi, United Arab Emirates. Emirates Steel and Vale have a long-standing business relationship that commenced in 2007 and has through this four-year contract strengthened into a strategic partnership. Emirates Steel has an iron ore pellet requirement of around 6 million tons per year. The agreement was signed by HE Saeed Ghumran Al Remeithi, CEO of Emirates Steel and Mr. Peter Poppinga, Executive Director, Vale during an official meeting held at the Emirates Steel office in the presence of senior officials from both companies. “The agreement with Vale comes in line with Emirates Steel strategy, which aims to secure flexible source of iron ore at competitive, stable and long term prices. 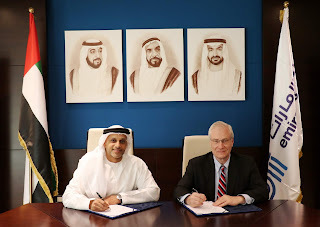 This new partnership plays a vital role to further strengthening the growth of our steel production in Abu Dhabi, as well as realizing our vision of being a world class steel manufacturer providing the highest quality products, services and solutions to our customers and maximizing returns to our shareholders,” said Mr. Al Remeithi. “We are confident that this long-term supply contract will give us more flexibility to better serve our customers, achieve our business targets and to continue our focus on operational excellence. We are delighted to have signed this agreement with Vale and look forward to working closely together," he added.